« After a long, slow week…a frighteningly fast one! It is so good to be home. The surgery went okay, I think…an ovarian cyst and some endometriosis spots removed, nothing complicated or sinister (?!). Now I just have to get through this frustrating few days of not actually feeling as good as I think I do and not being able to do all the stuff I want to do. Also, I’m tired all the time but I can’t sleep for more than a few hours. At least it’s good knitting time. 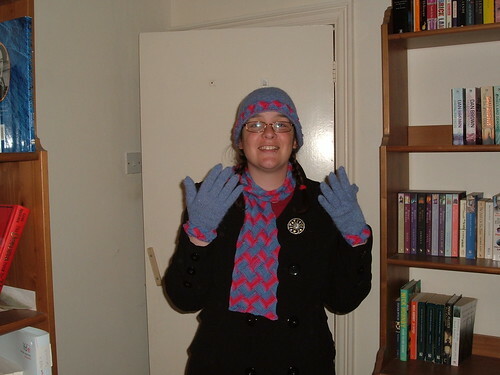 Speaking of which…I have finally (after exactly 3 months) finished my entrelac scarf, gloves and hat set ready for winter. They turned out so lovely, and the scarf has softened up beautifully after blocking. Now of course I have no reason to wear them for a bit longer, but they’ll keep. Soon I’ll think about starting A’s jacket/cardi, but don’t tell him that, it’s fun stringing him along and letting him think it’ll be months yet. At some point I’m also going to make a shawl for A’s cousin, then another shawl to take away on our cruise. I don’t know what is with the shawl thing, but it’s what I want to do, so why not? 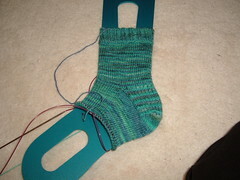 This entry was posted on August 28, 2009 at 8:55 am and is filed under Health, knitting. You can follow any responses to this entry through the RSS 2.0 feed. You can leave a response, or trackback from your own site.